While we were in Amsterdam, we decided to spend King's Day in Rotterdam where Inge took us on a tour of her home town. The first stop was the Urban Forest/Cube Houses. I was really excited to see these in person. The museum was open so we got to go inside of one to see what it would be like to live in one of these unique houses. I am torn as to whether or not I would want to live in one. I love it, but kind of think it would be impractical. However, if I did have the opportunity to live in one of these houses I think I would jump at the chance, no question. And there is not much more to say about that. This was taken with my Canon Elan ii and Arista 100. Developed in Diafine. Yesterday I spent the entire day meditating with this very wonderful group of people. 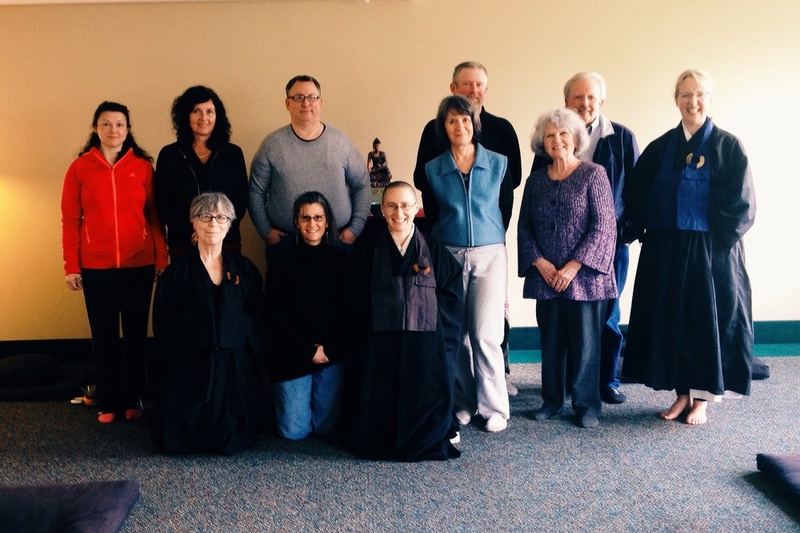 We all decided that we wanted a photo at the end of the day to mark this occasion: it was the first real retreat of our little local sangha. Sometime in the middle of the day I remembered that I brought my film camera loaded with black and white film. I was wanting to use up the roll on my walk to the retreat so I could have something to develop. I was delighted that I would be able to capture this moment on film! In the iPhone photo everyone is smiling and happy and it truly depicts the way we were all feeling after a day of meditation together. After I took this photo I took two more with my film camera. When I developed the photos from my film camera and scanned them the only shot that was useable was the one at the top of this post. It's not a bad photo but the faces are more stoic and not as smiley. I thought about what I might have done as the photographer to make the photos different and I remembered that for the iPhone photo I made a joke. I told them to "say whiskey." Everyone laughed because for the situation it was kind of out of context and maybe a little irreverent and our group laughs at irreverence. For the film photos they had been standing there for a few more moments. The joke was over and everyone was ready to move on. "I can't remember anything, can't tell if this is true or a dream"
The snow is all melted and long gone. It's like it was all a dream. I am not very good at coming up with titles of things. Photos are some of those things. I think titles are so important. As I move further into this hobby I am realizing this. I am realizing the importance of storytelling. I think the title is one of the very important elements in the story telling that goes on in photography. The viewer doesn't have much else to go on, there is the title and then there is the image. It is up to the viewer to create the story in their mind. The story is completely up to them. So I am trying to get better at titling things. With that in mind, I was looking at this image I took the day after our Ice Storm (this past Monday). I kind of liked it and thought I would upload it to Flickr. But, for the life of me, I couldn't think of a title. I thought of my standard "state the obvious" (ice on branch) but i'm sick of stating the obvious. I wanted to come up with something better than that. I decided to do something else, since my brain was being uncooperative. I would let fate title this photo. I turned iTunes on random and thought, "the first song that comes on, the first line of that song, that will be the title of this photo. I don't care what it is." So I pushed play and Metallica's One came on. I listened to the beginning musical lines and thought "wow, if I could title this photo with music this would be perfect" because have you ever sat and listened to the musical introduction to this song? It's really beautiful and sad and it seemed fitting. But then the first lines played: "I can't remember anything, can't tell if this is true or a dream." It was perfect. Absolutely perfect. Yesterday was kind of a momentous day for me. I am still reeling from the happiness of it. I developed my first roll of black and white film at home! I have been procrastinating this for two years – at least. It is something that has been on my mind for a very long time. For some reason – fear- kept me from doing it. I spent lots and lots of time researching it and thinking about it and envying those who were doing it. Then last year I took a Darkroom class where I learned how to develop film as well as make darkroom prints. Since March of last year I have been going into Newspace a couple of times a month to develop film, using their developer and most of their equipment. They have a beautiful set up. I have had my own tanks and darkbag for a very long time (two years maybe?) and so I’ve been pre-loading my film in my tank at home and taking into Newspace for developing. After months and months of using their developer (D-76) I decided that I wanted to play around and try new things. So I took the plunge and bought the chemicals and equipment to develop at home. I bought Adonal and was planning on starting with that doing stand development but while I was on a photowalk on Saturday, a fellow film photographer sold me on Diafine. It sounded pretty fool proof and simple (like stand development) but with way shorter development time. I picked some up and mixed it the next day. I let it sit overnight and decided to go for it with the roll I’d just finished. I read too much about it and debated whether I should or shouldn’t pre-soak. In the end I didn’t pre-soak but I ended up with some weird chemistry on some of the frames. After reading about it some more, I think I am going to try pre-soaking next time. We’ll see what happens. I can’t wait to try it again! I am happy with what I have scanned so far, issues aside. I am loving the contrast, I think. I am not sure how easy these negatives will be to print in the darkroom though. That is the final test for me because my goal is to make my time in the darkroom efficient.